Well, that is a serious in depth comment on the issues under consideration for the 2GPlan. It now remains to be seen how much notice will be taken, and if there is any retraction of the official position. It poses a lot of questions before the plan can be implemented, or at best a dropping of the whole issue of both ‘flood protection and rising sea levels’. Would the Mayor listen, would the staff of both the DCC and the ORC listen, or will they ride ahead roughshod and commit the city to unknown costs. It’s been seen before. Just look at the antics over the 2015 South Dunedin Flood reports. Mr Neil Johnstone will be interested for sure. Watch this space. Thu, 4 May 2017 at 1:54 p.m.
Globally averaged sea level appears to have been rising at the rate of about 6 inches a century for thousands of years. Until the advent of satellites, sea level was essentially measured with tide gauges which measure the sea level relative to the land level. Unfortunately, the land level is also changing, and as Emery and Aubrey note, tectonics are the major source of change at many locations. Beginning in 1979 we began to use satellites to measure actual sea level. The results were surprisingly close to the previous tide gauge estimates, but slightly higher, but one sees from Wunsch et al (DOI: 10.1175/2007JCLI1840.1) that one is in no position to argue that small differences from changing methodologies represents acceleration. Regardless, the changes are small compared to the claims that suggest disastrous changes. However, even in the early 1980s advocates of warming alarm like S. Schneider argued that sea level would be an easily appreciated scare tactic. The fact that people like Al Gore and Susan Solomon (former head of the IPCC’s Scientific Assessment) have invested heavily in ocean front property supports the notion that the issue is propagandistic rather than scientific. I haven’t spent much time on the details of the science, but there is one thing that should spark skepticism in any intelligent reader. The system we are looking at consists in two turbulent fluids interacting with each other. They are on a rotating planet that is differentially heated by the sun. A vital constituent of the atmospheric component is water in the liquid, solid and vapor phases, and the changes in phase have vast energetic ramifications. The energy budget of this system involves the absorption and reemission of about 200 watts per square meter. Doubling CO2 involves a 2% perturbation to this budget. So do minor changes in clouds and other features, and such changes are common. In this complex multifactor system, what is the likelihood of the climate (which, itself, consists in many variables and not just globally averaged temperature anomaly) is controlled by this 2% perturbation in a single variable? Believing this is pretty close to believing in magic. Instead, you are told that it is believing in ‘science.’ Such a claim should be a tip-off that something is amiss. After all, science is a mode of inquiry rather than a belief structure. The ‘warmest years on record’ meme …. The extreme weather meme …. Death of coral reefs …. Global warming as the cause of everything …. █ Richard Lindzen is the Alfred P. Sloan Professor of Atmospheric Sciences, Emeritus at Massachusetts Institute of Technology. The 2GPlan is being hijacked by the typical Nanny Brigade to control your life some more. It rains regularly, floods irregularly, sometimes really badly. Prepare yourself accordingly. The SEA LEVEL RISE MYTH continues via our local councils !! The biggest threat to the residents of Mosgiel, Green Island, etc is not from natural hazards, but from un-natural hazards arising from the very bad decision-making of the DCC councillors and CEO. For several years 3-waters spending has been diverted towards various pet projects and the funding of stadium losses and other losses. Residents in areas affected by the DCC’s wilful degradation of the city’s stormwater system should take no comfort from these hopeful sounding words. We are told that the high level report is secret (if it even exists) and that the funding that they are talking about is only to get an estimate of the cost of the options. Something over $20 million per year (my guess) for over ten years will be needed to make a difference to those currently at risk from the DCC’s bad management. The DCC CEO has indicated her reluctance to spend this much: she said 26/4/16 (ISC) – If councillors want to make a decision to get the South Dunedin, Mosgiel to a one in 10 year flood level, then there are considerable implications of that . As I said here last year: Here she is telling councillors that if they want a properly functioning stormwater system then there will be no money from Santa Claus for all of their various wasteful, vote-buying, ego-boosting pet projects. It looks to me that [the] CEO was trying to discourage councillors from fixing the stormwater pipes – and apparently this worked . ● Councillors need to understand that council staff have their own agendas and that they should never accept staff suggestions without careful thought and independently verified fact-finding (most of them don’t have this capability). Neil Johnstone is being far too kind to the ORC in describing its South Dunedin ground-water modelling. He says that the ORC modelling was imperfectly calibrated and unverified and that the modelling was unreliable . The modelling purports to predict the South Dunedin ground-water level for various levels of sea-level rise as a way to promote the ORC and DCC’s view that the groundwater level is linked to the sea level. We know that this modelling is a complete failure because – with the model trying to predict groundwater levels for the current sea level, the simulation shows permanent flooding, of over 100mm, in several places, which is a huge error of about 600mm compared to reality. This total failure to simulate the current situation means that the modelling is completely invalid and all of its predictions should be discarded. 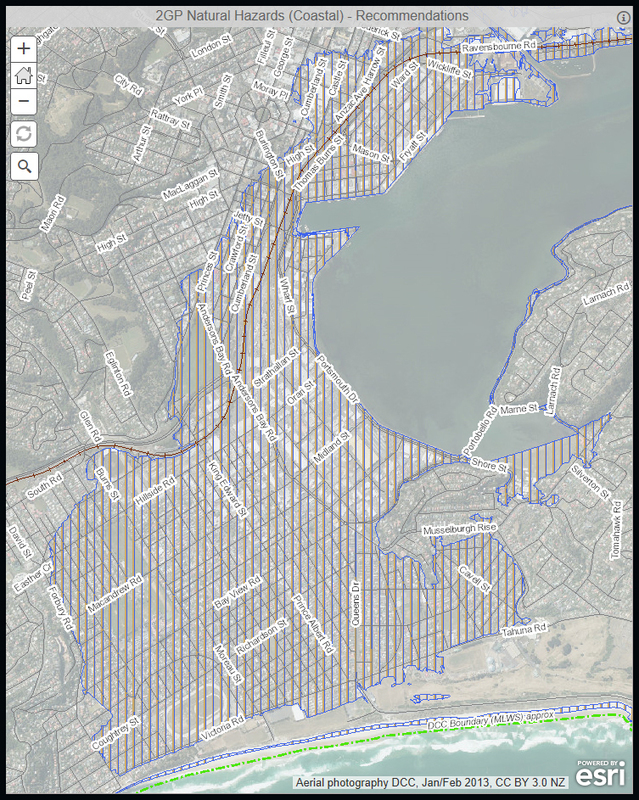 The ORC has therefore failed to show that for the major part of South Dunedin, the level of the groundwater is linked to sea level. It seems to me that for this work to be published (in 2012 and 2016) takes the involvement of a lot more staff than one or two grossly incompetent groundwater modellers. The failings are severe and must have been obvious to ORC senior staff. The question is, was the ORC so obsessed with getting the result that they wanted, that they were prepared to compromise their honesty. My view is that this work, which has a large influence on the 2GP, is fake science and dishonest. If they,…. the ORC ‘wallahs’ would comment on Prof Lindzen’s remarks above and refute them – if they can – then they would have a half a chance of being supported. Failure, or ignorance is not acceptable. but watch them. Watch also the dopey untrained bureaucrats pick up and run with the mob. The Global Climate Alarmism bureaucracy advise their followers to avoid debating the scientific validity of their Global Warming theory. They think they don’t need scientific credibility, as long as they have enough media and political support. People believe what they see on TV: when the TV tells them that Global Warming caused this flood or that drought, then that’s what they believe – there’s no genuine science involved, just propaganda and dishonest reporting. Their reliance on fake science means that they are vulnerable to real science. Some of the local bureaucrats are highly paid and skilful Spin-doctors. The DCC and ORC Comms teams have been working together to manipulate public opinion and councillors’ opinions. I believe they have a common comms plan. Like the Church Of Scientology they are organised, devious and persistent. We have seen how quickly they exploited the Dunedin 2015 flood to help to promote their climate alarmism.